Manufacturer of a wide range of products which include flag printing machine, canvas printing machine and digital direct textile printer. Printing Fabric Linen,Silk,Fur,Nylon,Terylene,Chiffon,Real Silk Banner. 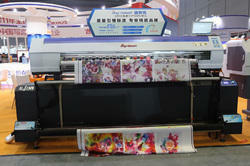 Pioneers in the industry, we are offering an excellent range of Fabric Printing Machine. It's Multi-row pinch rollers assures that machine can print with perfect size of feeding media, the offered printing machine is designed with supreme grade components of our well-equipped developing area in compliance with market norms. Our offered printing machine can be availed in various models at highly affordable price. 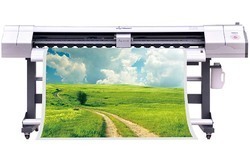 By keeping track with the technological development, we are offering optimum quality Canvas Printing Machine. 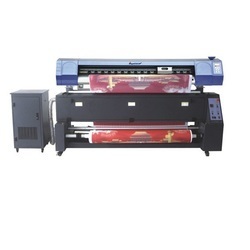 We provide this sublimation printer in numerous specifications. Our experts use the finest quality material and leading technology for manufacturing. We ensure our customers that this sublimation printer is quality inspected on specified parameters to meet the quality standards. By keeping track with the technological development, we are offering optimum quality Digital Direct Textile Printer. We provide this sublimation printer in numerous specifications. Our experts use the finest quality material and leading technology for manufacturing.